BALLARAT Saturday. -- The Minister for Education (Mr. Hutchinson) on Saturday performed the ceremony of laying the foundation-stone of a new school at the Orphanage. Mr. Hutchinson said that the greatest wealth was not in gold or grain, but in human lives with trained hands and cultivated brains. At luncheon Mr. Hutchinson referred to the fact that the foundation-stone had been taken from the wall of portion of the gaol, which had been demolished in order to make room for a new technical school. This was an indication of the truth of the saying which the late Sir Thomas Bent was so fond of quoting, "Education is the best policeman." Increased educational facilities, which would help to develop the mind and moral sentiment, would be amongst the best safeguards against the Bolshevism and other disorders which were threatening the community at the present time. The chief secretary (Major Baird) jocularly remarked that, in the recent disturbances in Melbourne, education had not saved the necessity of calling in the policemen who were under his department. The Government was determined to make the police force a strong and efficient body. The great body of the people were loyal to law and order. But there were others who were against law and order. With these the Government would deal fairly, but firmly. 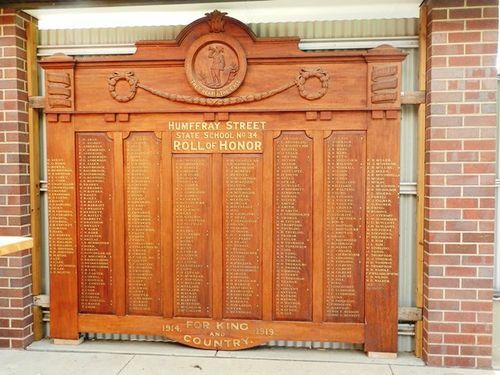 Subsequently the Ministerial party visited the Humffray street State school, where Mr. Hutchinson unveiled an honour board, containing about 300 names. Amongst those present were members of the 39th Battalion, about 50 of whom have their name on the honour roll. Argus (Melbourne), 28 July 1919.